1. Dornoch Area Community Council Secretary's Report 1984-5 (2 sheets with paperclip). 2. Copy letter from Dornoch Area Community Council to Divisional Engineer 15 May 1985 (single sheet). 3. Minutes of Dornoch Area Community Council meeting 3 June 1985 (3 sheets stapled). 4. Minutes of Dornoch Area Community Council meeting 2 Sept 1985 (3 sheets stapled). 5. Copy letter from Dornoch Area Community Council to Divisional Engineer 5 Sept 1985 (single sheet). 6. Unsigned handwritten letter to District Councillor Roddy Mackay 8 Oct 1985 (2 sheets folded in envelope). 7. Three letters re confusion over local ballot on relocation Oct-Dec 1985 (3 sheets stapled). 8. Minutes of Dornoch Area Community Council meeting 4 Nov 1985 (2 sheets stapled). 9. Minutes of Dornoch Area Community Council meeting 9 Dec 1985 (2 sheets stapled). 10. Sutherland District Council memo from Director of Technical Services to Chief Executive 11 April 1986 (single sheet). 11. 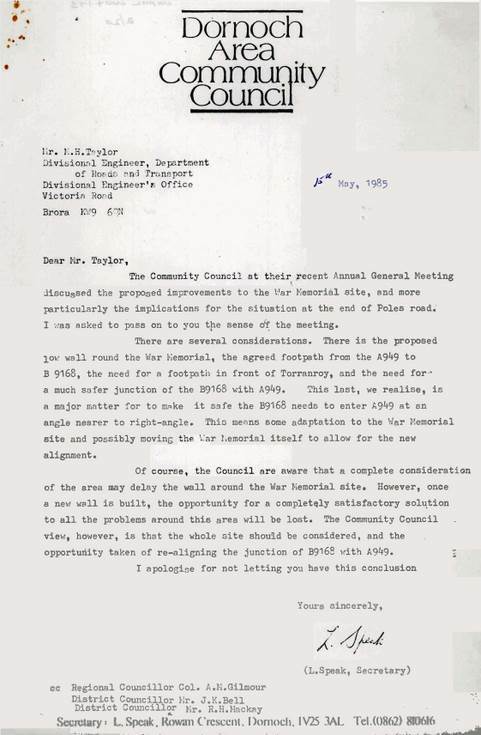 Letter from HC Planning Officer to H Steele, copied to Jimmy Bell 24 June 1991 (2 sheets stapled). 12. HRC plan 223/15 showing proposed location and surrounding roads July 1987 (single sheet). 13. HRC plan 223/17 showing proposed landscaping in Castle Street Nov 1983 (single sheet). 14. HRC plan 223/28 showing detail of proposed layout no date (single sheet). 15. Photocopy of above (2 sheets). 16. HRC plan 223/29 showing proposed location and layout amended June 1991 (single sheet). 17. HRC plan 223/29 amended showing alternative landscaping no date (single sheet). 18. Photocopy of part of above (single sheet). 19. HRC plan 223/36a showing proposed location with landscaping along Castle Street amended March 1992 (single sheet). 20. HRC plan with no number showing proposed changes with handwritten notes by Jimmy Bell no date (single sheet).